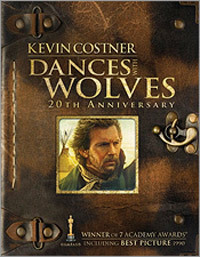 1990 seven-time Academy Award winner, including Best Picture, Dances With Wolves represents everything that can go right in modern, commercial American moviemaking, all of which can be seen in MGM’s 20th Anniversary Blu-ray release. The drama movie offers up an exceptionally compelling story, gorgeous cinematography, fine performances and a memorably emotional musical score to create a lush, engrossing film that continues to resonate with audiences. 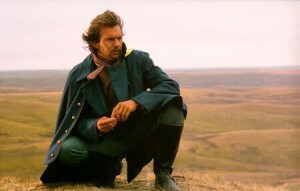 Regardless, the newly restored movie looks just beautiful on Blu-ray, the many shots of plains, hills and western skies drenched with color. Contrast is excellent — there’s almost zero picture grain — and details such as the hair on Kevin Costner’s (Bull Durham) arm are clearly visible. When director of photography Dean Semler and editor Neil Travis talk on their commentary track about how the crew spray-painted trees to create an autumn setting, those orange and red-tinted leaves are readily apparent in the distant background. The 7.1 DTS HD soundtrack is impressive, as well. John Barry’s score soars, and the many scenes you’d expect to pack a punch, such as the buffalo hunt and stampede, deliver the goods and then some. Don’t watch this while anyone in the house is asleep. Semler and Travis’ commentary track, breezy and full of interesting tidbits, is one of two carried over from the handsome but long-discontinued special edition DVD, the other track featuring Costner and producer Jim Wilson. Most of the other special feature from that set, including J.M. Kenny’s 81-minute retrospective, also appear on the second disc of this Blu-ray release. New for the Blu-ray are two interactive features that pop up while the movie unspools: a Military Rank and Social Hierarchy Guide, which is exactly as its name implies, and Real History or Movie Make Believe, which quizzes viewers on whether various moments have their basis in fact or are purely fictional. It has been 20 years since director/producer/star Costner caught lightning in a bottle with this epic film. To view it again, in virtually the same quality it first appeared on movie screens (sans extra scenes) is a real treat.